iTi Performance Motorsports wants to help you get ready for the Dune Season. 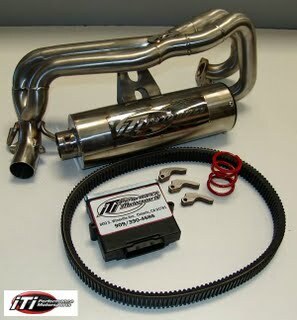 We are pleased to offer our Polaris RZR/RZR-S Exhaust, ECM and Clutch Kit to you for a price of $1,379.00. When you buy this package you will receive a FREE Kevlar Drive Belt! This promotion ends on November 1, 2009 so don’t delay order yours today. Call (909) 390-4686 or visit the iTi web site at www.itimotorsports.com. Please Note: an ECM core charge of $415.00 is due at time of purchase and is refunded when we receive your old working core.